The KRION® transformation process is long and delicate. Only expert hands can work the material with great precision and dedication to allow perfect finishes to be created. Our transformers, many of them members of the KRION® Affinity programme, have the adequate training and in K·FUSION find great technical solutions for undertaking any project. K·FUSION is the solution which allows complementary cast pieces to be joined to sheets of KRION® with imperceptible joins to achieve sensational seamless compositions. The endless designs and combinations that can be obtained, along with the different transformation techniques and colours, allow design solutions to be offered for all environments, such as personalised countertops for kitchens and bathrooms. All of these possibilities also allow integrated bathtubs and shower trays to be added, adapting to any aesthetic, functional or dimensional needs of the client. 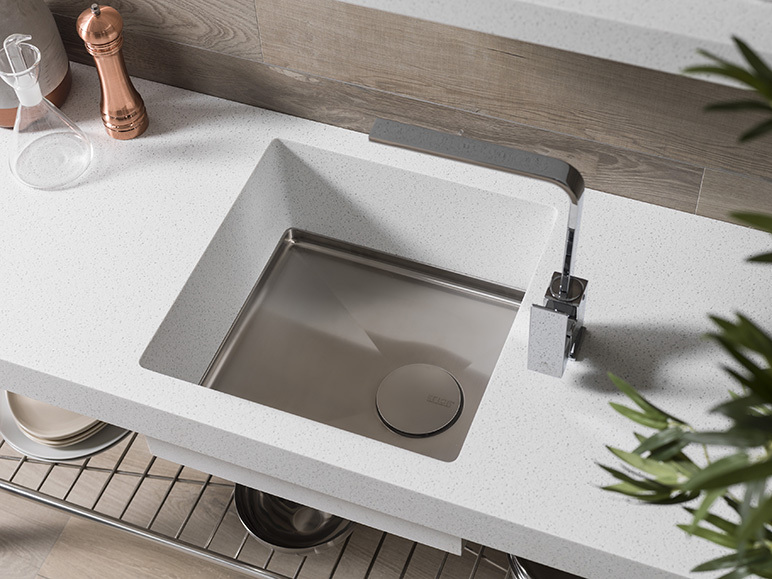 The complementary cast pieces are available in the pure 1100 Snow White colour, and there are also several series of sinks with stainless steel based finishes and satin, anthracite, gold and copper tones. In the video we will show, part of this work can be observed, demonstrating how a sheet and a sink are combined with cutting, milling, bonding and sanding techniques to obtain a fully functional kitchen countertop.